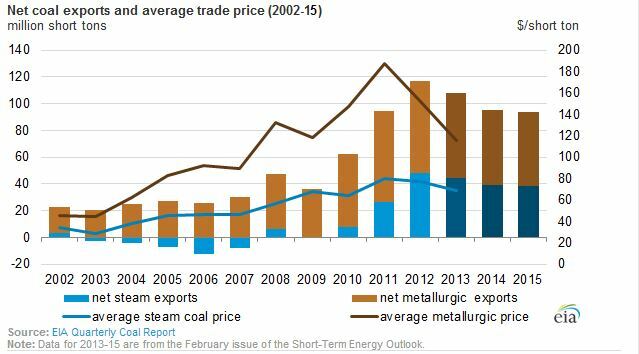 The dollar value of US net coal exports has increased more than three-fold since 2005, data from the US Energy Information Administration (EIA) shows. "Although coal trade only accounts for about 5% of trade flows in energy fuels, the volume of U.S. coal exports has steadily increased, from 50 million short tons (MMst) in 2005 to a record 126 MMst in 2012," the EIA wrote. While coal exports declined slightly in 2013 compared with the previous year, they've been rising dramatically since the beginning of the 21st century. The US' biggest coal customer is Europe, account for 50% of exports, followed by Asia. "[C]oal exports will continue to be important for companies involved in coal production and transportation," the EIA wrote. "Key drivers of future U.S. coal exports include global coal demand and production challenges that may arise in domestic production in China and India, the world's major coal consumers, and in production by leading global coal exporters, including Australia, Indonesia, and South Africa. The domestic coal market has its own set of issues: Rising natural gas production has driven a decline in US coal demand and the Environmental Protection Agency's (EPA) new regulations could force many coal-fired power plants to shut down. In fact, a survey of US coal consumption by end-use sector shows a significant decline in coal use in every sector. US electric-power industries used 649 million short tonnes of coal last year compared with more than 1 billion short tonnes in 2007.